for my one and only girl. She turned 19... I am getting O.L.D. I have been baking birthdays cakes since they were young (except for few occasions when HR Laziness took over my life). One of the ‘challenges’ when it comes to baking a cake... BIRTHDAY cake!!! is when the person celebrating birthday is unsure of the cake he/she would like to have! When asked, followed by a reply... "Surprise Me!" is not an answer I am wanting to hear. 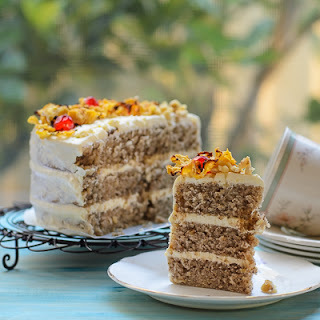 afterall I’ve read much about hummingbird cake in the past. Hummingbird has cream cheese frosting all over. My creativity has its limits... I can have lots of ideas but when it comes down to frosting.... I am sloppy, very sloppy! evidence in all my bakes :(. The final touches that makes it all ok again. 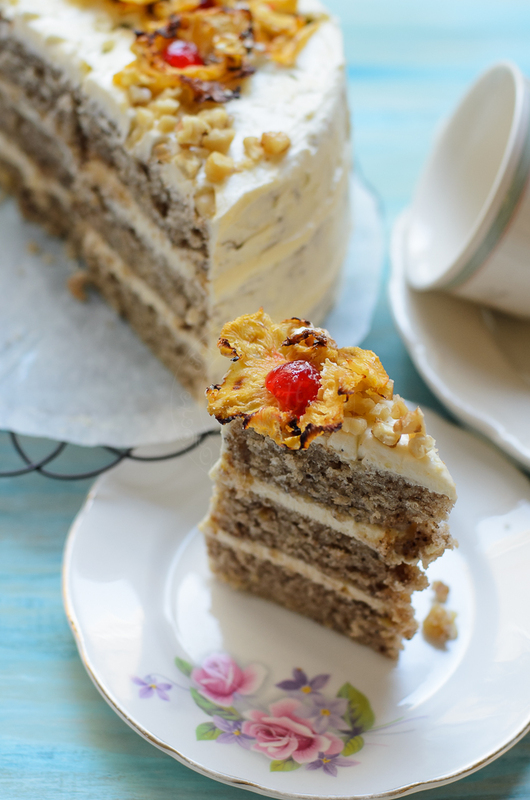 I was chaffed with my pineapple roses :D.
I made some changes to Mrs LH Wiggins' (of Greensboro, North Carolina) hummingbird cake, especially the sugar content in both cake and frosting. Both side of families has over load of sugar in their blood stream, so I need to exercise caution on our sugar intake. Click on the word highlighted above to take you to the original recipe. 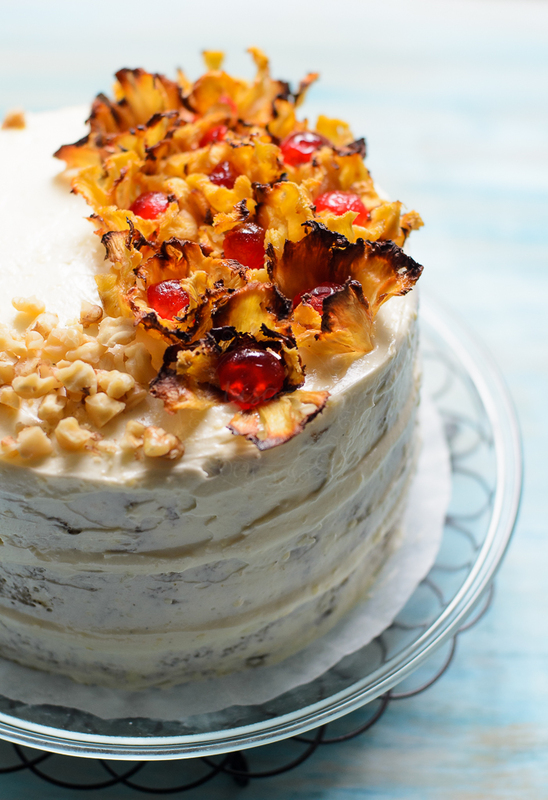 Decorations: Roasted pineapple slice, cherries and crushed walnut. Line 3 round 8 inch cake pans with greaseproof paper. Whisk plain flour, sugar, salt, ground cinnamon and baking soda. Add vanilla, pineapple bananas and crushed walnut. Divide batter into 3 pans equally. Bake at 180C for 25-30 minutes or until skewers comes off clean. Remove from pan to cool on wire rack. Repeat with the remaining 2 batters. Trim cakes to have a flat surface as possible. Spread cream cheese frostings on one cake and top with another cake. You an either leave it as that or you can spread the frosting to the sides as well. Decorate with pineapple roses and crushed walnut. Pineapple Roses : Remove the skin and the nodules. Thinly sliced pineapple, remove the core using cookie cutter. Place flat on flat baking sheets. Roast on 140C until pineapple slices changes colour and caramelised. Careful not to burn the slices. Carefully lift up and arrange in mini muffin pan (or equivalent) and leave to cool for further use. It looks really beautiful! I love esp. those pineapple flowers. Great flavors in this cake and you taught me something with the execution. Very elegant. 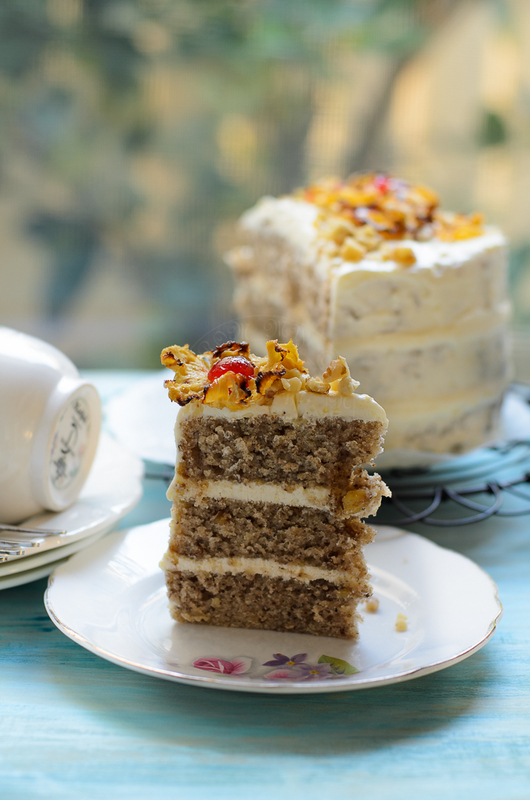 I've never heard of hummingbird cake- it looks beautiful!!! I love the pineapple on top- great job! I had this cake for the first time recently and it was tasty! Your recipe sounds great! I look forward to trying it. Your cake is much prettier than mine would've been! I think all said, you handled "surprise me" quite well! Thank you Sandra for your kind words.